I have experience of raising concerns in the NHS and private providers of NHS services. I am not represented by Patients First or any other organisation. 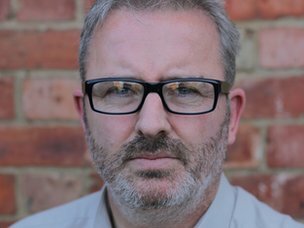 My experience in NHS was whilst employed as a service manager from 2006-2010, and involved many concerns which were raised over 3 years including: inaccurate reporting of performance data; fraudulent activity of medical staff; experiences of bullying; dangerous working environment; inadequate service cover and staffing levels. These concerns were raised as I became aware of them and reported directly to my line managers, senior managers and service leads as appropriate; through supervision, various forums and meetings. Most concerns were not addressed or resolved satisfactorily i.e. the problems remained or created another problem, therefore I continued to pursue issues in an effort to seek resolution. Eventually, I became more isolated and managers and colleagues alienated me. During the same period I was tasked with improving the standards and performance of the community services I managed, which involved performance managing some of the staff and implementing change. Where performance management was required I ensured that I sought advice and support from HR throughout, and made reasonable adjustments for people to adapt to change. However, on two separate occasions different staff members raised allegations of bullying against me in response to such management. Both allegations proved unfounded, however on both occasions I was ‘operationally suspended’ i.e. temporarily removed from my role whilst the investigation was held. None of the staff members concerned faced any disciplinary actions following false allegations, and my managers, investigators and HR ignored my concerns that I was being victimised. On commencement of the second allegation I also raised a grievance which included all of my concerns to that date, and at that point the investigation was escalated to a disciplinary hearing. The organisation did not follow ACAS guidance and tried to pursue the disciplinary before the grievance, however then arranged to hold the grievance and the disciplinary on the same day. On this day the disciplinary was immediately thrown out without question, and despite a massive file of my concerns to that date, these were given scant regard although my grievance was partially upheld. However, I was never allowed to return to my role as service manager on the grounds that I needed time away to heal from the experience. Following the outcome of my grievance I questioned the outcome, reinforcing that I needed to return to the role I had held, however I was told by the director that if I insisted on this, the disciplinary investigation would be resumed. I was promised that at the least, I would be able to return to meet with the team to be vindicated, but this did not happen and I later learned that the allegers both received apologies from the director for the experience they had suffered, and an implication that my being moved from the team was as some form of disciplinary action. I was moved to a team to be managed by someone who was known to have had previous allegations of bullying against them, who then directly bullied me, following which I resigned. Whilst working my notice, I also raised my concerns in writing to the CEO and other senior directors, but received no acknowledgement or response. I had support from an RCN officer during the disciplinary and grievance and that was very helpful. I was then passed to the RCN legal team for assessment of my case after I resigned and a case was put forward for constructive dismissal as a result of whistleblowing and an application made to the employment tribunal (ET). This was the first time that I saw my actions as ‘whistleblowing’. The whistleblowing element was removed from the case early on by the judge due to a timing issue. The case reached a conclusion before tribunal, but I was ‘gagged’ from speaking of my experience. I wrote to the CQC to escalate some of the issues I had raised as they still had not been addressed. One concern regarding dangerous working premises, when raised by the CQC led to the Trust immediately removing the team from the building and relocating them – I had raised the same concern over a period of three years and no action had been taken in that time. The CQC also wrote to me to advise that other concerns had been put to the CEO who had given assurance that issues did not remain but that evidence would be sought at the next inspection. I was also advised to take my concerns to the parliamentary ombudsman, which I later learned was inappropriate as they act only on behalf of patients. I also received an apology from the Trust which is subject to confidentiality outside my immediate family. My second experience was whilst working for Serco Healthcare at Yarlswood Immigration Removal Centre. Following my experience in the NHS I was unsuccessful in applying for numerous jobs in the NHS, initially at the same level (service manager) as I had been employed, but then at entry level and ‘bank’ roles, turning also to private healthcare. Eventually after a period of almost 2 years I commenced employment as a bank nurse at Yarlswood in January 2012. After a few weeks I was asked to take up the post of Mental Health Lead-tasked with developing mental health pathways on a 3 day per week contract. I quickly identified concerning mental health issues which needed addressing. Mostly acute in nature and related to risk – i.e. suicide and self-harm. I also identified that officers did not have relevant training to manage these risks and some had negative attitudes towards these behaviours and residents. In March 2012 the role increased to 4 days per week due to the increased demands. From the start I fed back all my findings and concerns to operational and healthcare managers and made suggestions on how these could be addressed. I also raised concerns around a lack of clinical supervision for healthcare staff. I also uncovered issues with access to emergency NHS mental health services for residents. The healthcare manager suggested I put my concerns into a business plan for consideration. In completing this I researched previous reports and inspections into Yarlswood including HMIP 2011, IMB 2010, and Bedford needs assessment and found the same concerns had been raised before. I also found that some policies and processes were not being implemented appropriately. The business plan included all of my concerns and findings, and different suggestions for change based on existing models of mental health care provision in similar populations. I made it clear within the business plan that the status quo could not remain as it was not sufficient to address the needs and safety of residents. I sent the business plan to the healthcare contract manager on 1st October 2012. Following this the manager made it clear they were not happy with the plan and began to act with increasing hostility and began to bully me: making increasing demands on my work with the prime concern of fulfilling contract obligations; being increasingly critical of my work; making a false accusation of shouting against me; and physically pushing past me aggressively on one occasion. Eventually I requested a reduction in my hours back to 3 days per week as the bullying was intolerable. In response the manager said that I would no longer be mental health lead and that my role would be completed by a different mental health nurse each day. I expressed my concern that this undermined the service and did not address any of the issues I had raised. I reported the incidents of bullying and escalated my concerns to the regional manager. A grievance was formally raised on my behalf on 1st November 2012, whilst I was on leave. I returned to work on 5th November 2012 and was immediately suspended by the Centre manager, for ‘failing to follow the instructions of healthcare management’. I was never given any detail of what I had failed to do, and never received any detail of the investigation despite it being progressed to a hearing in January 2013. The terms of reference were also very vague and indicated that there was no evidence to support my alleged misconduct. I was also instructed to contact a named manager before 10am on each day that I would normally be on duty. Serco never followed ACAS guidelines or employment law with regards to the whole investigation as it continued despite my grievance never being concluded. I wrote to all managers to say that I considered my suspension to be a direct result of my raising concerns, but this was ignored. I also raised my concerns, and provided written statements during each of my meetings with investigators but was told that it was not the appropriate venue to address them. The initial grievance outcome was appealed based on it being unfair due to my suspension; that it had many inconsistencies; that it was inappropriately handled (both the grievance and disciplinary were overseen by the same manager); and that my concern that the suspension was in response to me raising concerns had not been addressed. The appeal process was initiated under another director, but was never concluded. The disciplinary hearing was put on hold only after the intervention of the RCN rep. Arrangements were made for me to enter Yarlswood under supervision to access evidence in support of my grievance and my claims that I had ‘whistleblown’, but this was cancelled at the last minute. As no progress was made and the concerns I had were still not being addressed, I escalated all of my concerns to the then CEO of Serco Chris Hyman, and further raised to Valerie Michie, Serco MD. Throughout my suspension I was supported by an RCN Rep who was very supportive. A senior director was tasked to help resolve my concerns. They arranged a confidential meeting for me, my union rep and a member of Serco’s legal counsel. It was agreed that an investigation would be held into the concerns to be completed within 6 weeks, and that I would be interviewed as part of this. Terms of reference for the investigation were agreed at the meeting, but were later diluted so that they only looked at contractual obligations. Myself and the RCN rep recommended that Serco report my concerns to CQC and have them involved in the investigation. However, the counsel said they contacted CQC informally who advised an internal investigation was sufficient. Serco subsequently nominated their own external investigator, but I was never interviewed. It was also agreed that the senior director would look into my disciplinary and agreed that I could stop reporting to the named manager by telephone on my normal days of duty. Initially the director asserted the validity of the disciplinary. When I challenged this quoting the evidence, the suspension was immediately lifted and the investigation was dropped without explanation. A meeting was then arranged with me, my union rep and a senior HR director to resolve my employment issues. My union rep and I stated that issues including the grievance should be resolved before my return to employment. However, both directors disagreed and instead offered 3 options – return to Yarlswood, redeployment or leaving the company. Details of the first 2 offers were provided, but were deemed inappropriate. Therefore I asked for further details on the 3rd option as this was not provided at the time. As the investigation into my concerns had not started and Serco refused to inform CQC, my concerns were escalated to Bedford CCG by the RCN on my behalf, stating that I was also available to talk to them for further detail. 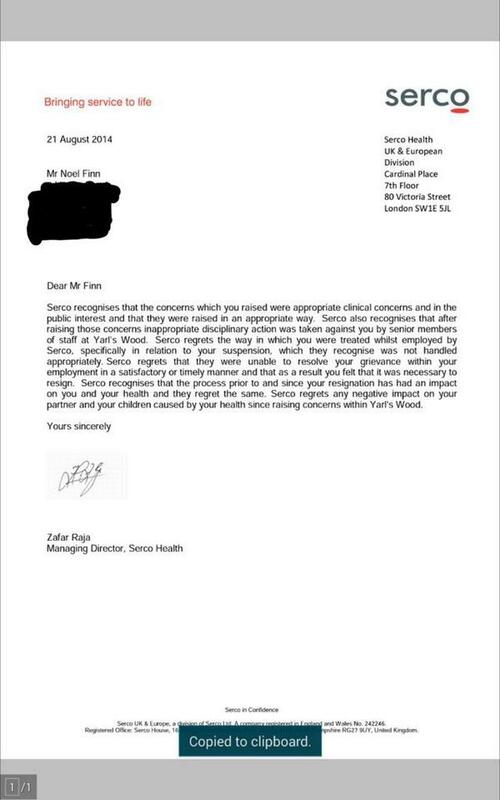 As the commissioning arrangements for Healthcare at Yarlswood were in transition my concerns were forwarded to NHS England, who then spoke to the manager who had bullied me; Home office and the CQC. However, the concerns were not disclosed in detail and I was never contacted. HMIP and CQC both later performed inspections and did not record that disclosures were made and therefore did not look at the issues. Through a FOI request I later learned that CQC were not given any detail of the disclosures from Serco despite asking for them. At the 6 week deadline the investigation had still not been started, and I was forced to resign my post. My case was then referred to the RCN legal team. They advised that whilst it was clear that I had whistleblown and suffered detriment, they would not argue for constructive dismissal or apply to ET as they would not take the financial risk. Their analysis on the success of my case was flawed. They advised to negotiate a settlement. I expressed concern from the outset that Serco’s actions against me were a serious concern for the nursing profession and therefore in the RCN’s and public interest to address, but they refused to pursue due to constraints on funding. I proceeded therefore with the advice but insisted on an open apology as part of the remedy. Twice the legal officer made serious errors and resolution was still not in sight as the deadline for application to ET approached which the RCN still refused to support, therefore I withdrew from the RCN and sought independent legal advice. My new legal team agreed to make an application to ET and advised me to apply for legal fees under my household cover or ask RCN to cover my expenses. Neither option was successful so I had to self-fund. During the whole experience I became very depressed and reluctantly started antidepressants in late 2013. At the request of Serco and my legal team I was seen by an independent psychiatrist for assessment. The psychiatrist suggested I had suffered Occupational injustice, and that I was not recovered sufficiently to return to a clinical role, he also suggested that moving into an unskilled role may be demeaning, therefore recovery was difficult to determine. I was subjected to additional stressors through this process and continued expenses when I expected the case to be resolved. The case was eventually concluded over a year after resignation and I have received an open apology from Serco which recognises that the action taken against me was as a result of raising concerns, in the public interest, and was inappropriate. Main problems were that people consistently did not listen or even acknowledge what I was saying, and did not act. In both experiences people made judgements about me as a troublemaker and for managers it seemed the easiest way to address problems was to get rid of me, anything else was too complicated. There seemed to be a stronger culture of achieving targets and my concerns seemed to get in the way of achieving those. In both experiences, colleagues often quietly agreed with my concerns but refused to speak out in fear of reprisals. RCN legal team I believe have a conflict of interest with regards to nursing as their financial constraints prevent the public interest being served. The ET is not a fit place for whistleblowing as it is meant to represent individual employment issues and not the public interest. Timing issues should not be relevant to whistleblowing. Whistleblowers are not experts in employment law but healthcare companies have HR and legal teams on hand to advise at every opportunity meaning they have the upper hand. Finances also put employees at a disadvantage and thanks to Mr Vince Cable, the very individuals, who need to have a voice are unable to do so due to cost pressures, unemployment and having to pay for Employment Tribunals. On the ET application the new ‘whistleblowing box’ was ticked but the information was not raised to regulators, when I called the local Employment Tribunal office they did not even know who the CQC or HMIP were, this was shocking as the raised concerns need to be forwarded onto them. To this day I am still not aware if this has been done. Regulators and responsible bodies failed consistently and more often took the assurances of organisations at face value rather than going to the source or exploring assertively in greater detail. The experiences I had could be likened to abuse, however I think this is not at all appreciated or acknowledged anywhere and is not possible to resolve via ET. I also submitted evidence to the Healthcare select committee and the Home affairs Select committee and have received no response or acknowledgement. I believe the fact that the issues I raised related to mental health and latterly also immigrants, meant that they were less likely to be addressed as less priority or attention is given to these areas, and the present government does not make it any easier for these groups of people. There should be a duty for all NHS (including commissioned providers) to report all concerns openly and for these to be taken to the board as the first step for oversight, assurance and accountability. The CQC should have an independent element which is solely responsible for addressing whistleblowing concerns to ensure quality this includes involvement with other providers such as NHS England. Whistleblowing detriments should not be taken through ET’s and should not be sectioned off into mild, moderate and severe pay-outs, this is nonsense; the detriment is a subjective thing, you can’t measure one against the other, people react and cope differently. It should have a separate process to ensure that public interests are not kept secret and any organisation found to have acted inappropriately against whistleblowers should be put in front of a public committee for scrutiny. This is another example of the avalanche of complications that occur when there are multiple failures in dealing with these issues. Piling on the problems delays the time it takes to reach an endpoint to the stress and uncertainty. Damage to mental health is inevitable to even the strongest minded people. Any whistleblower must be the sort of person with strength and resolve to not follow the flock. the term “whistleblower” is negative and should be dropped. It sounds like an accusation even thogh It describes a person who has the integrity to resist pressure to overlook bad practice by superiors. This is encouraged in the airline industry because of safety issues and so should be in medicine. Apart from the issues referred to here, people should check out Serco. This is a massive sinister corporation operating globally. Go to YouTube and search for “Serco, the biggest company you’ve never heard of”. You will be amazed and frightened when you see what these guys are up to.